The fact that the compromise solution presented by the Romanian Presidency contains the introduction of a UGC exception shows the intention to make a positive contribution to the negotiations. However, the drafting is far from bringing a meaningful solution for users. To start, the proposed exception only allows the use of parts of works, making it impossible for users to share user-generated content containing an entire artwork (e.g. a meme using a painting in its entirety) or an entire short work (e.g. a meme using a poem in its entirety). Then, it only allows users to share content generated by themselves, and not by others! What is the point of sharing a meme on an online platform, if other users cannot interact with it, by sharing it too? Last week, the German delegation proposed a remunerated UGC exception (basically, paying for sharing a meme) and left us wondering if the lawmakers understood the rationale (freedom of expression and freedom of creation) behind a UGC exception and the value of platforms to users. The UGC exception now presented by the Romanian Presidency as a possible compromise solution only reinforces our concerns about the ability of lawmakers to foresee all the consequences of their proposals. Again, there were good UGC exceptions on the table, such as the ones proposed by CULT and IMCO and also by individual MEPs. There’s no need for lawmakers to keep reinventing the wheel, if they really want to take a step in the right direction and adopt a mandatory EU-wide exception that will – provided that no upload filters are in place – facilitate everyday sharing practices that are for purposes such as criticism, review, caricature, parody, etc. 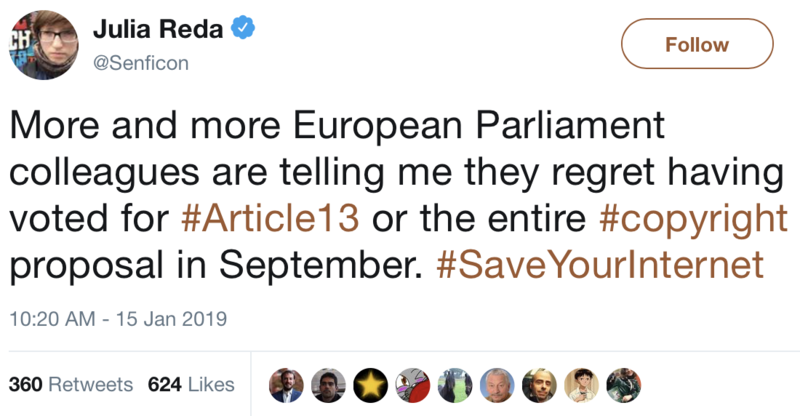 Meanwhile, the direction in which the negotiations on article 13 are going continues to swell the ranks of its critics. Several organisations representing rightsholders from the audiovisual and publishing sectors are “extremely and increasingly concerned” and, thus, have called for the suspension of the negotiations with respect article 13. According to these organizations, the Commission should wait for a decision of the Court of Justice of the European Union in case C-682/18 concerning Youtube’s liability for copyright-infringing content uploaded by its users, and only then decide whether legislative intervention is necessary. This entry was posted in EU policy and tagged article 13, copyright, copyright reform, eu-policy, exceptions and limitations, fixcopyright, trilogue, upload filters, user generated content, users rights. Bookmark the permalink.